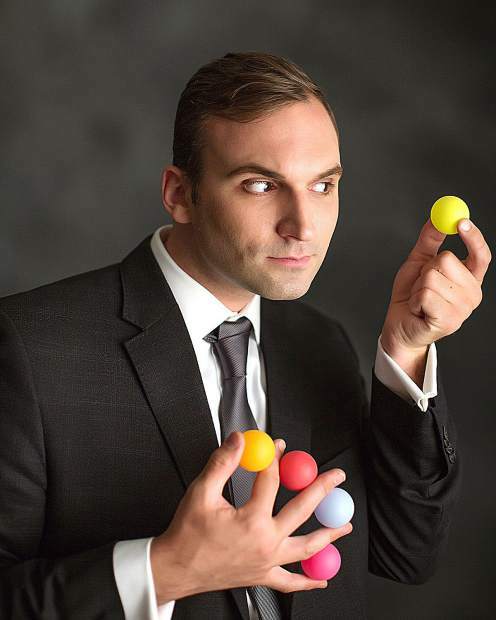 Nick Federoff will be bringing his magic act back to the variety show at The Stone House. After over-selling their premier show last month, the Nevada City Variety Show is back with a brand new line-up of live performances at The Stone House on Sunday. Magician Nick Federoff and comedian Trevor Wade return as co-producers and co-emcees to bring a melange of acts to the local stage. And audiences are hungry for that truly amazing something. “Fortunately, the Stone House is a restaurant, so they can satisfy all of their hunger in one spot,” said Wade, a stand-up who has performed comedy and told stories in as far-flung places as New York City; Reyjavik, Iceland and Juneau, Alaska. If audience members are hoping to get a bite to eat, the hosts recommend making an early reservation, because they might not have a table come show time. To this end, it is recommended would-be attendees buy their tickets in advance. The tavern will be open before and after the show. Tickets are only $15 and can be purchased at tiny.cc/stonehousevariety. Doors open at 7 p.m. and the show starts at 7:30 p.m. Sunday. Due to the potential mature content of the show, it is recommended for audience members age 18 and older. Federoff has toured internationally and worked at corporate trade-shows and street fairs alike, delighting audiences both young and old with his unique style of magic and mentalism. After five years in New York City, where Wade performed regularly at Eastville Comedy Club and was a company member at the Reckless Comedy Theater, he has returned to his roots with jokes and stories that are as likely to tug a heartstring as crack a smile. The rest of the variety line-up changes with each show and this month’s endeavor will feature burlesque, music and more.